I have tried quite a few amazing products this month, so I wanted to group them together and do my monthly favourites. May was quite a horrible month for me, finishing up my dissertation and making sure I had it all together. Anyone who has ever written a dissertation will know that it is like a form of torture and it takes a lot of time. Moving on though, during this month I allowed myself certain shopping breaks as a reward and break from my work in order to maintain my sanity. 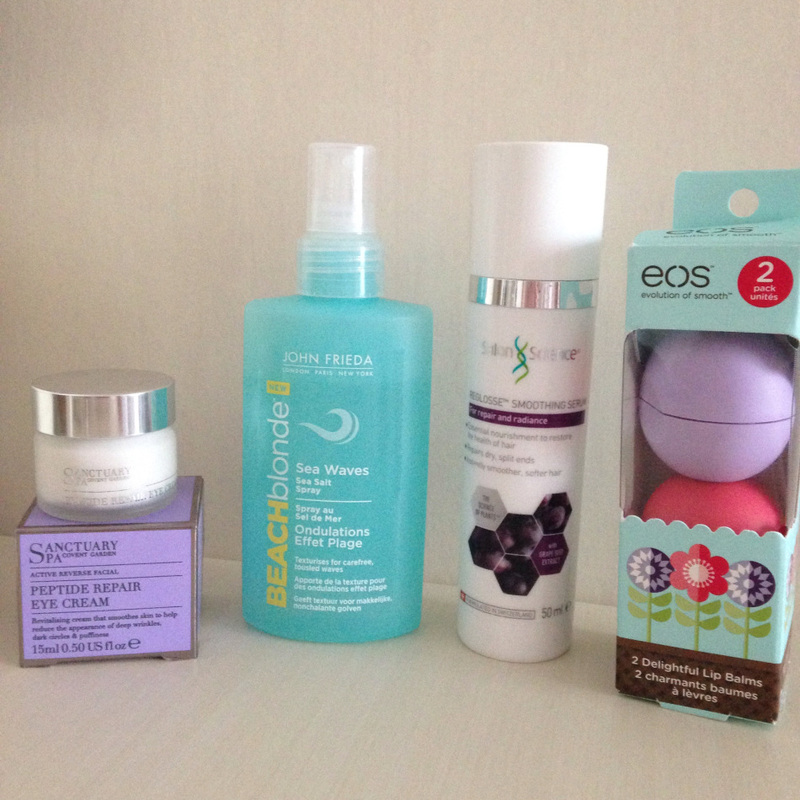 I have discovered some fantastic products this month and they are all must haves!! So lets dive in. My mum has always told me to take good care of my face and moisturise it, never leave makeup on and if you treat your face well you will age well. I had not been getting much sleep in May due to stress and worrying, which meant I had really bad black eyes so I was in desperate need of a good eye cream to help down play my black eyes. I was looking across the shop shelves unsure of what to go for, when I came across Sanctuary Spa products. My family literally rave about their body products, but I hadn't heard much about their face ones. I went with it in the end as it was reduced and looked really good, I am beyond glad that I did because the eye cream is amazing!!!!! This is hands down one of the best products I have ever tried and I love it. The texture is really good, it is quite thick which means you do not have to use tons and a tiny amount will suffice. It glides on to your skin making it feel soft and hydrated, because it isn't liquid-y it doesn't make your skin oily or anything which is a plus. The packaging is stunning and elegant, it also makes it look very expensive but don't let that scare you away because it is money well spent. £18 for eye cream is a decent price, as most of the ones I found were around that or higher. I am definitely going to repurchase it and would recommend it to all those who are having sleepless nights or stressed, it really helped my bags. I mean that aren't gone, it isn't that magical but it does help minimise them and smoothens them out. I recently did a blog post about EOS lip balms and my love for them, but they deserve to be on the list as I go a different set. I was out shopping with my friend Nicole, when we went into Topshop and saw they had a limited edition duo set of EOS lip balms. As soon as we saw there were two in the packet we were both kind of sold and both came out with a set. In buying the set you save £1.50, as they are individually £7 which isn't a big save but still worth it. They are also different to the individual ones sold in Topshop and do not have the flavours, the two in the set are passion fruit and fresh watermelon. They both smell wonderful and I mean a girl can never have too many EOS lip balms right?! EOS lip balms have literally been a life saver during May, my lips were dry, cracked and in desperate need of a miracle basically. The miracle came in the form of EOS and I am so happy I bought more. I absolutely love John Frieda hair products, they are fantastic quality and don't physically hurt me when I buy them. They recently released the Beach Blonde range with a shampoo, conditioner, sea salt spray and conditioning mask. I bought the sea salt spray and the conditioning mask, but trust me I would have purchased it all if I could afford it. However, I somehow managed to restrain myself with only two products. The range looks incredible and the packing is very summery. John Frieda has another winner on their hand and I actually really like the smell, it is a bit different but nice. I can't really put my finger on what exactly it is but it is good! The sea salt spray is my favourite out of the two items I bought and my hair feels amazingly soft. You apply it on towel dried hair, don't dry it with a hair dryer for the proper effect and once your hair dries it should leave it nice and wavy. It really enhances my wavy hair and I love it! I got this little gem in a beauty box and it is one of the best hair serums I have tried, my hair feels so much softer and smooth. It smells heavenly, I really cannot do it justice just how good the scent is and it is very summery. I tend to use it every couple of days or whenever I feel my hair could do with a pick-me up. I hadn't tried any Salon Science products before and now I have, I definitely want to see what else they have to offer. The texture is nice, not too liquid-y but not too thick either. They have found the perfect balance so it doesn't go goopy or gel like in your hair. I only included four items on my list, as I really wanted to focus on why I liked them that much and if not this would probably be a 2,000 word blog post. These four items are amazing and I would definitely recommend them!